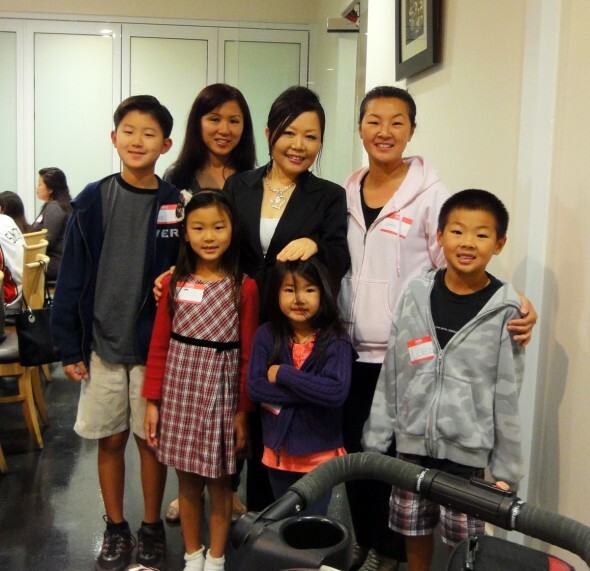 On Sep.21 at 6:30 pm, we met as planned at a Korean restaurant in Buena Park, California. The restaurant gave us a private room so that we could talk and eat, which was great. I appreciate everybody’s effort to join us, including those who couldn’t make it at the last minute. Here is the video and some photos that we took. One of my long time readers and movie director Paul Whang volunteered to film. Thank you, Paul! On my left, the lady with long hair is Erin and her 2 children: Ryan (standing right next to his mom) and Lisa (with headband). 12 year old lady Taylor gave me this letter and I’d like to share this with all of you. She came with her aunt Mindy Kim. Thank you, Taylor! You love dried anchovy side dish? (myeolchi bokkeum: 멸치볶음). No wonder you look tall for 12 years old. You ate lots of calcium from the dried anchovies! Calcium helps grow our bones. : ) Why am I short? heh, maybe I didn’t eat much myeolchi bokkeum when I was young? The little girl Lauren told me, “Thank you for your all delicious recipes, Ms. Maangchi!” I still remember her cute and clear voice “Ms. Maangchi”! Posted on Thursday, October 7th, 2010 at 9:40 am. Last updated on February 15, 2015. Posted March 30th, 2011 at 9:36 pm | Log in to reply. Hi Maangchi… I too am a year late :) Hopefully you will be visiting us on the West coast soon. Thank you for the wonderful and easy step by step instructions to your recipes. Look forward to meeting you and also making more of your delicious food! Posted March 30th, 2011 at 10:46 pm | Log in to reply. Keep checking my blog. i always post my meetup plans there. Posted January 10th, 2011 at 6:35 pm | Log in to reply. in Southern California, I’d like to join the fun. Posted January 11th, 2011 at 5:14 pm | Log in to reply. Loretta, sure, I’m looking forward to meeting you, too! Posted October 8th, 2010 at 9:13 pm | Log in to reply. Oh my gosh this looks like such a fun meetup!! Everyone is so happy and has great stories :D One day I would love to attend a get together with Maangchi and the other fans! Posted October 9th, 2010 at 3:47 pm | Log in to reply. yay! looking forward to seeing you soon! Posted October 8th, 2010 at 11:25 am | Log in to reply. It was so great to meet you and your readers. Taylor and I really had a wonderful evening – we’re still talking about it! I hope everyone is doing well and I hope to see all of you again at the next L.A. Meetup! Thank you Mindy and Taylor! Everybody who came to the meetup say they had a great time and it was awesome to meet other Korean food fans.